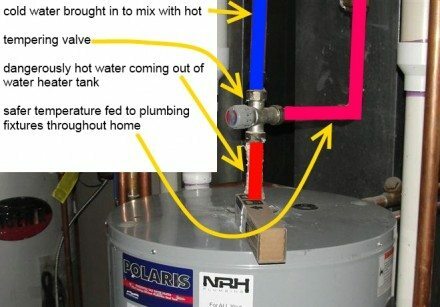 After writing a blog post about leaking temperature and pressure relief (TPR) valves at water heaters, I learned that this particular issue seems to completely befuddle folks. In the two years that I allowed comments, that post received 245 comments, including my own. The majority of the comments were questions from readers who were trying to troubleshoot their own leaking TPR valves. I spent so much time responding to questions on that one blog post alone that I finally disabled comments on blog posts over 90 days old. Responding to reader comments on old blog posts was turning into a part-time gig for me. The good news is that while answering reader questions, I ended up doing a fair amount of research to help myself understand problems that people were having, and to make sure that the advice I was giving was correct. The purpose of this blog post is to give some troubleshooting advice to people with leaking TPR valves. All water heaters are equipped with a temperature and pressure relief valve. This valve will allow water or steam to escape from the water heater if the temperature or pressure gets too high; these valves are set to open when the pressure reaches 150 psi, or when the temperature reaches 210 degrees fahrenheit. This prevents water heaters from exploding or turning into missiles. The rest of this blog post is going to be about troubleshooting a leaking TPR valve. If a TPR valve leaks, either it's defective or it's not. If it's not defective, it's leaking because the temperature was too high or the pressure was too high. In other words, a leaking TPR valve indicates one of these things: a defective valve, excessive pressure, or excessive temperature. If a pressure relief valve for a boiler is accidentally installed on a water heater, it will leak like crazy from the start. These valves may look identical, but they're set to go off at 30 psi, not 150 psi. As I mentioned in my original post about leaking TPR valves, an easy troubleshooting step is to replace the leaking valve. TPR valves cost less than $15 and they're fairly easy to replace. If you're not sure how to go about doing this, hire a plumber. If you're trying to do this on the cheap because you can't afford a plumber, search YouTube for videos of "relief valve replacement". You'll find a ton of 'em there. If a new, proper TPR valve leaks, it's probably just doing its job. It's relieving excessive temperature or pressure. The next step is to figure out which one it is. This one is pretty simple. Run some hot water at a plumbing fixture and take a temperature reading with a meat thermometer. Make sure there are no tempering valves installed between the water heater and the faucet; whole-house tempering valves are typically installed at the water heater, and look like the type shown in the photo below, which I used in my blog post about safe water temperatures. If one of these valves is installed, the temperature you'll get at the faucet will be less than the temperature inside the tank, by design. New single handle bath tub faucets installed in Minnesota since 2013 also require tempering valves (http://www.structuretech1.com/2013/04/new-safety-requirements-for-bath-tub-faucets-in-minnesota/). Those valves are typically installed below the bath tub, but can sometimes be found near the water heater. For the record, a safe temperature for water coming out of faucets is 120 degrees. Temperatures in the 150 degree range are downright dangerous and in need of attention, but still wouldn't explain a leaking TPR valve. Temperatures really need to approach boiling to set off a TPR valve. This is extremely unlikely, but I suppose it is a possibility. If the pressure in the plumbing system exceeds 150 psi, the TPR valve will leak. Getting to the bottom of this issue should be quite simple and straightforward. 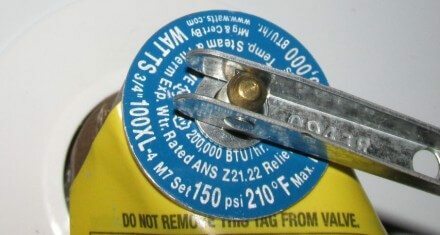 Buy a pressure gauge with an extra indicator to show surges, and connect it to the plumbing system. It doesn't matter if it's connected to a hot or cold water pipe, because both will be at the same pressure. The easiest way to do this is to get a gauge with a garden hose thread, connect it to an outside garden hose faucet (sillcock), and open up the faucet. You should expect the pressure to be somewhere in the 40 - 80 psi range, with no other water running. If the pressure is over 80 psi, it should be corrected. The solution is to have a pressure regulator installed. Get a plumber to do that. If the pressure is within the acceptable range, you play the waiting game. Once the temperature and pressure relief valve at the water heater leaks, go check the pressure gauge. 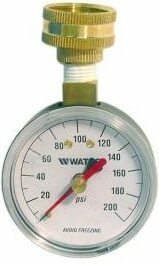 If the 'surge indicator' shows something at or near 150 psi, the problem is excessive pressure. Excessive pressure is typically the result of a closed system; the water heats up and expands, but it doesn't have anywhere to go, so the relief valve does it's job and relieves the pressure. The solution, as I mentioned in my original blog post (http://www.structuretech1.com/2012/01/leaking-relief-valve/), is to install an expansion tank. If an expansion tank is already installed and there is still a problem with excessive pressure, either the expansion tank is not installed properly or it's not charged properly. I may write another post later this year on solving excessive pressure, because that seems to be the most common problem that people deal with.